Students can get some experience using the scanning electron microscope in the UBC Bioimaging Facility whether for a project or just for interest. Students doing projects are trained on the equipment and then they can supervise other students. Many images primarily of sporophytes contribute to the website and enhance lectures. Alyssa Weinstein and Hannah Fiegenbaum examined sporangia and peristome teeth. Check out their cool website. This year Esther Yuen and Christina Jiang examined the hyaline cells of a number of Sphagnum moss species. They made a really interesting WordPress site to show their pictures as well as share a little about how SEM is done. 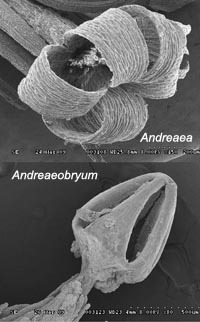 Andreaea and Andreaobryum are two genera that until recently have been classified in the same class. Current research indicates that although very similar (note the dehiscence of the sporangium) they belong to separate lineages near basal on the moss clade.